AAA is a non-profit motor club organization that Robert Darbelnet started in 1902. The original purpose of AAA was to supply drivers with a myriad of services that they could use in case of vehicle emergencies. Consumers know AAA well for its roadside assistance services. AAA provides services such as towing, lockout service, fuel fills and tire exchanges for its members when they are in need. However, roadside assistance is not the only service that AAA offers. AAA offers a wide range of financial products and discounts, as well. The AAA Visa card is one of the financial products that the company offers. The AAA Visa card is a superb card for members of the AAA auto club who would like to earn AAA dollars toward their membership or several alternative items. A traveler can use the AAA Visa credit card in millions of physical locations and online stores. The same merchants who accept regular Visa cards will accept the AAA Visa credit card. Cardholders can use their cards for gas, groceries, auto rentals, hotel stays, plane tickets, train tickets and more. An applicant must be 18 years of age to apply for the AAA Visa credit card. The person must be a member of the AAA as well. People who apply for the AAA Visa credit card will need to have fair to good credit, as well. A FICO score of more than 640 points is considered a fair credit score. A FICO score that is higher than 700 is considered a good credit score. The consumer’s chances of obtaining approval increase with his or her credit score. The lender will consider other factors such as the person’s debt to income ratio before it approves a card. The AAA Visa card has a wealth of benefits that come with it. One of the main benefits of the cards is that it allows cardholders to earn AAA dollars. 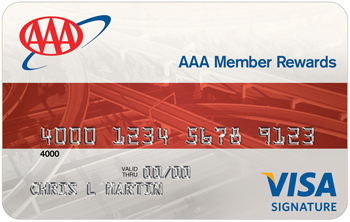 AAA dollars are credits that a cardholder can use toward his or her AAA membership. Alternatively, the cardholder can use the accumulated points to receive travel vouchers, auto repair vouchers or cash redemption options. The AAA card gives the cardholder the flexibility to use his or her reward any way that he or she pleases. A cardholder can earn AAA dollars by simply using his or her card to make purchases. Cardholders receive 3 percent AAA dollar rewards on the purchases that they make through AAA or with travel companies. Cardholders will receive 2 percent AAA dollars for their purchases on drug store items, gasoline and groceries. All other purchases will reward the cardholders with 1 percent AAA dollars. Therefore, the cardholders can earn dollars no matter what they buy with the card. Additionally, the AAA dollars do not have a limit on the amount that one person can earn. The AAA Visa card does not have an annual fee associated with it. The card does have a few transaction fees, however. Late payments have a $35 fee and returned payments have a $25 fee. Foreign transactions have a 2 percent charge, and cash advances have a 3 percent fee. Balance transfers can accrue a 3 percent charge, as well. The interest rate for a new cardholder can fall anywhere in between 12.99 percent and 22.99 percent. The company determines the cardholder’s initial APR based on his or her creditworthiness at the time of the application. The AAA Visa card has a wealth of positive reviews from consumers. The consumers are pleased with the card’s reward system and its lack of an annual fee, and cardholders appreciate that they have so much flexibility in how they can use their rewards.